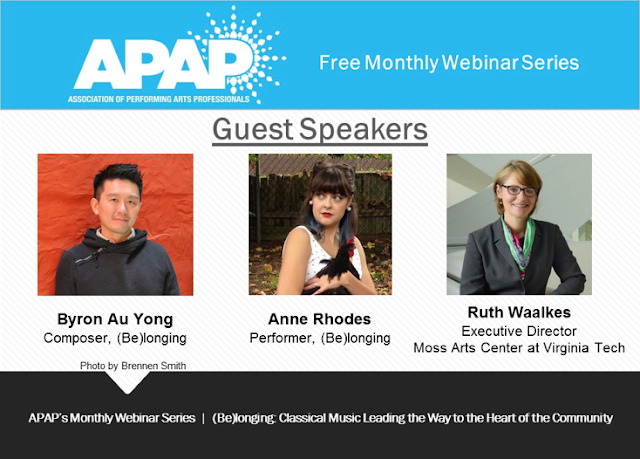 (Be)longing: Classical Music Leading the Way to the Heart of the Community webinar as part of Classical Connections and the Association of Performing Arts Professionals (APAP). "In this webinar we examine an innovative model for using music to develop community dialogue around challenging issues by highlighting the recently debuted (Be)longing, a choral/hip-hop oratorio focused on coming of age in an era of gun violence." Barrie Steinberg, Executive Director, International Arts Foundation, Inc.